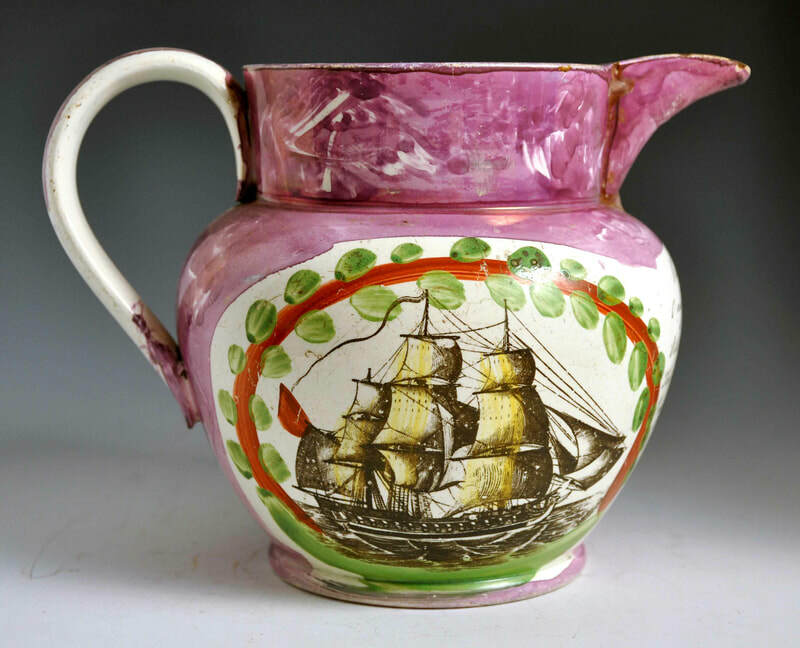 To date, these jugs with green flecks have all been attributed to Cornfoot, Carr & Co, North Shields. 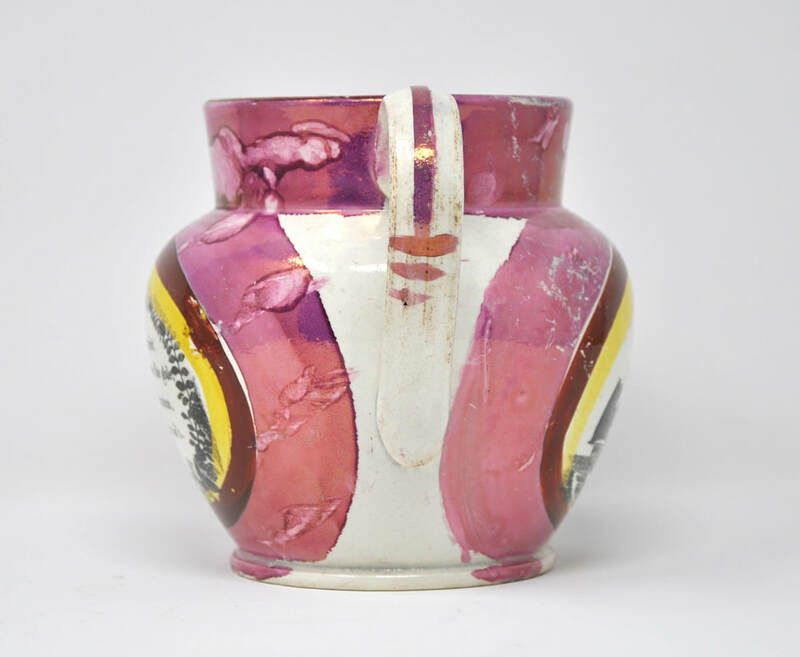 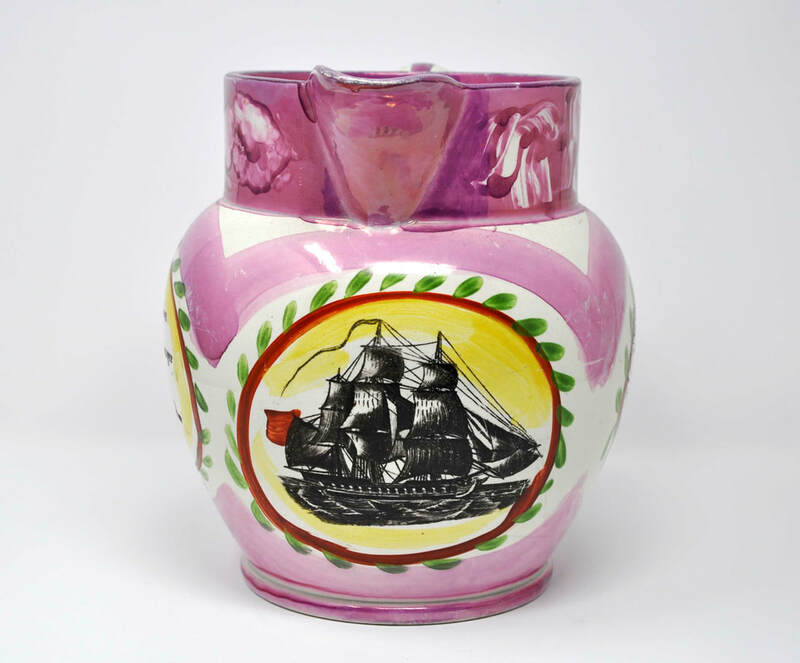 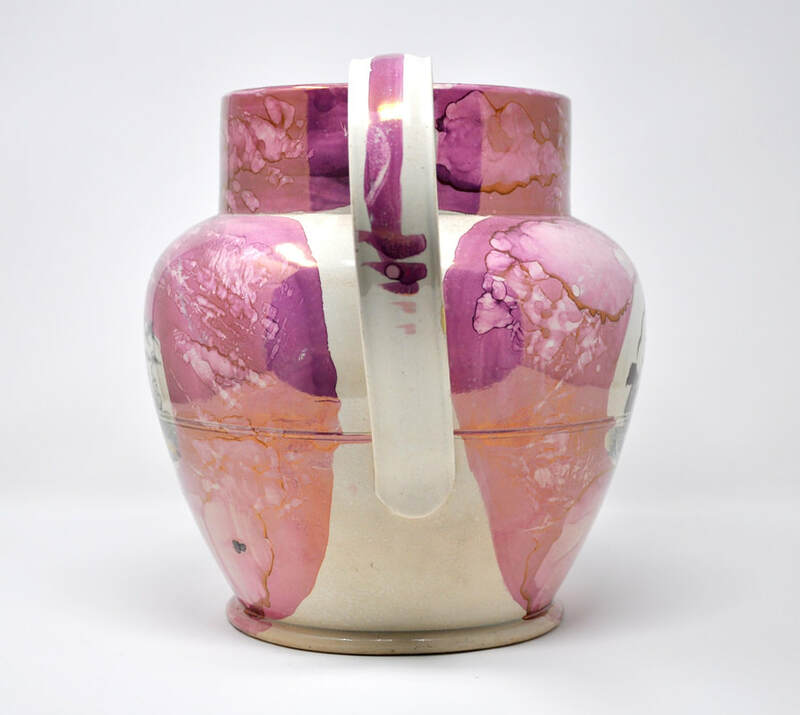 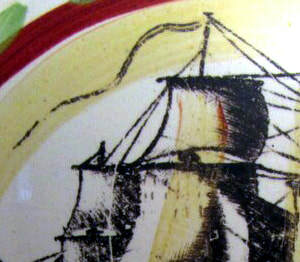 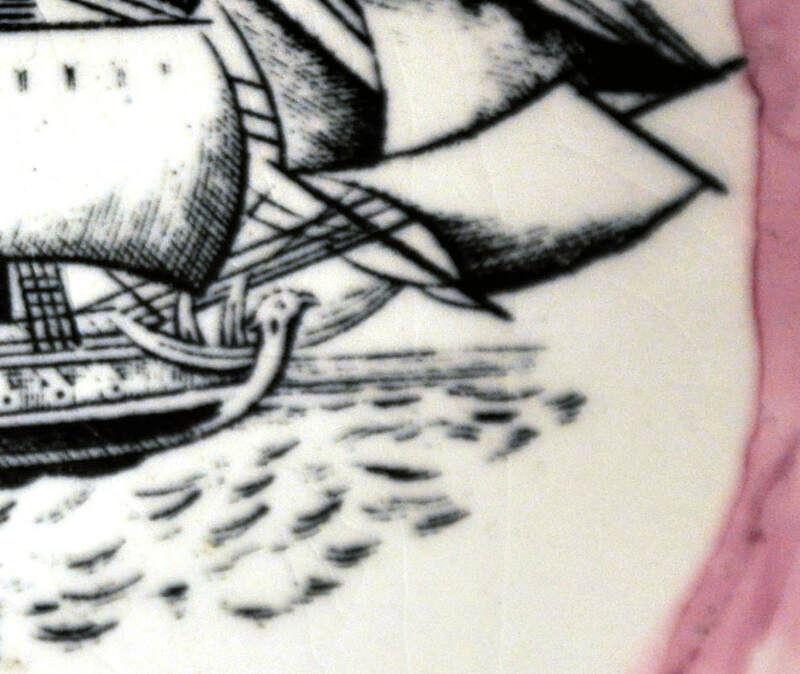 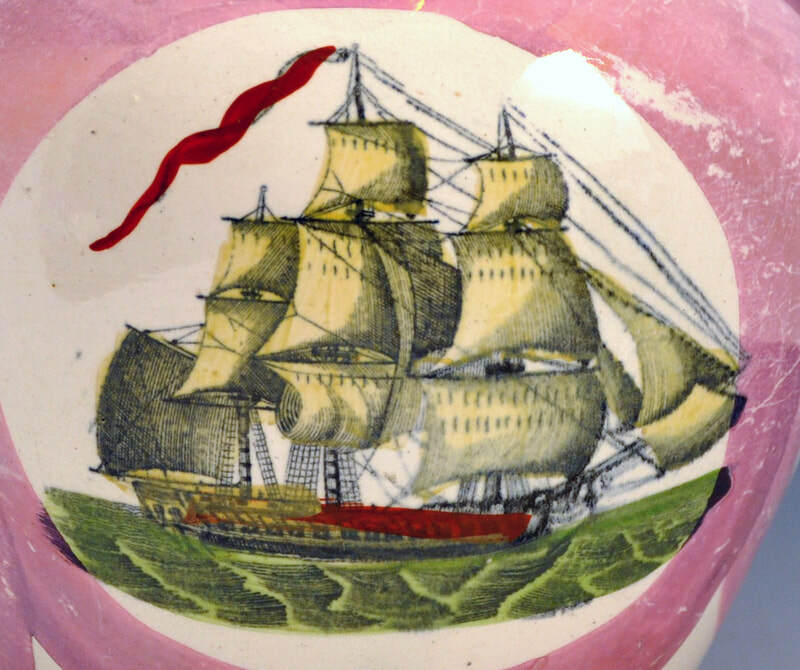 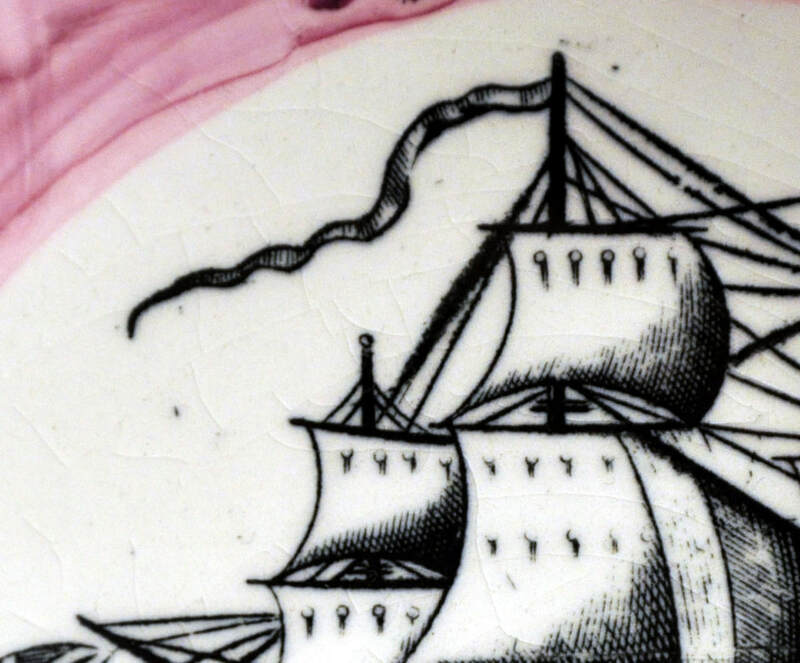 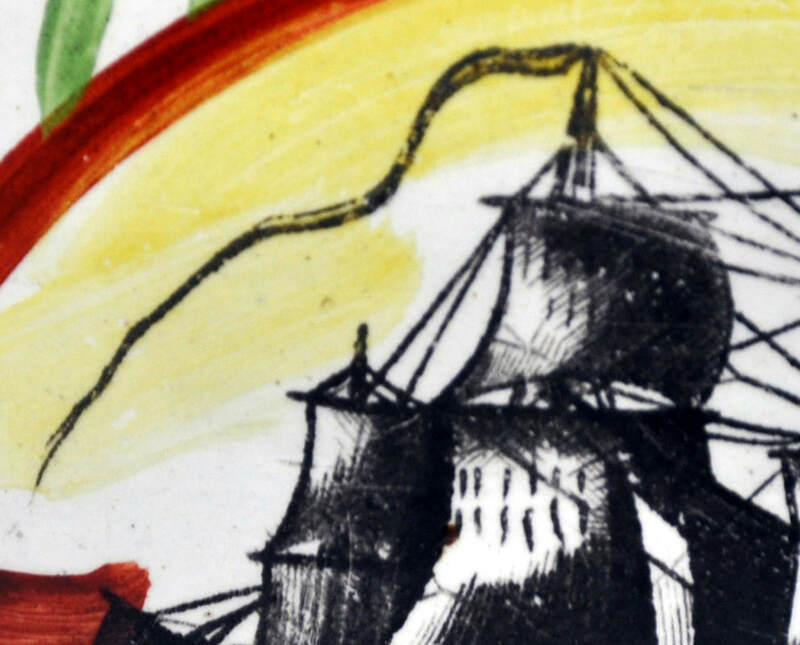 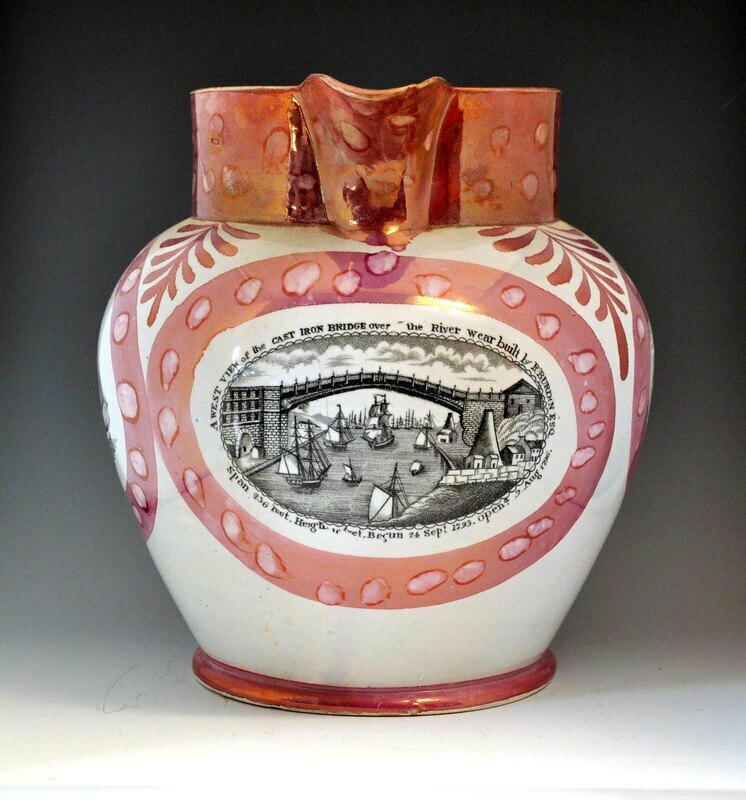 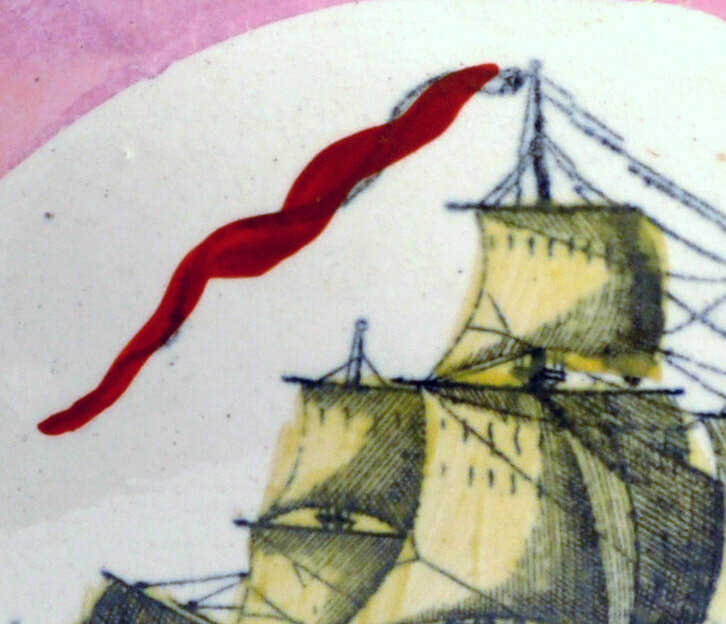 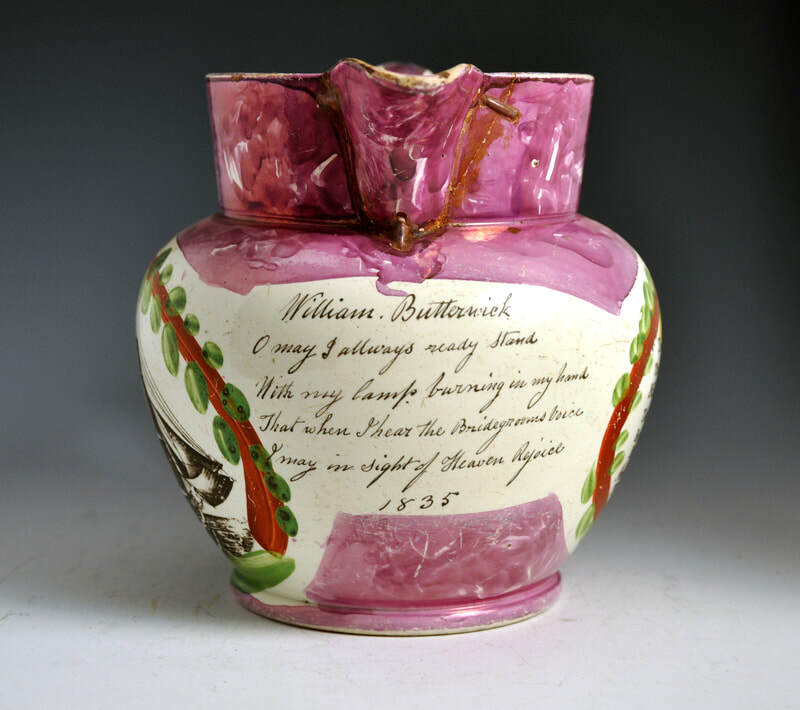 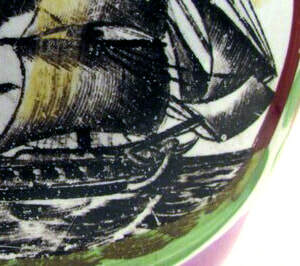 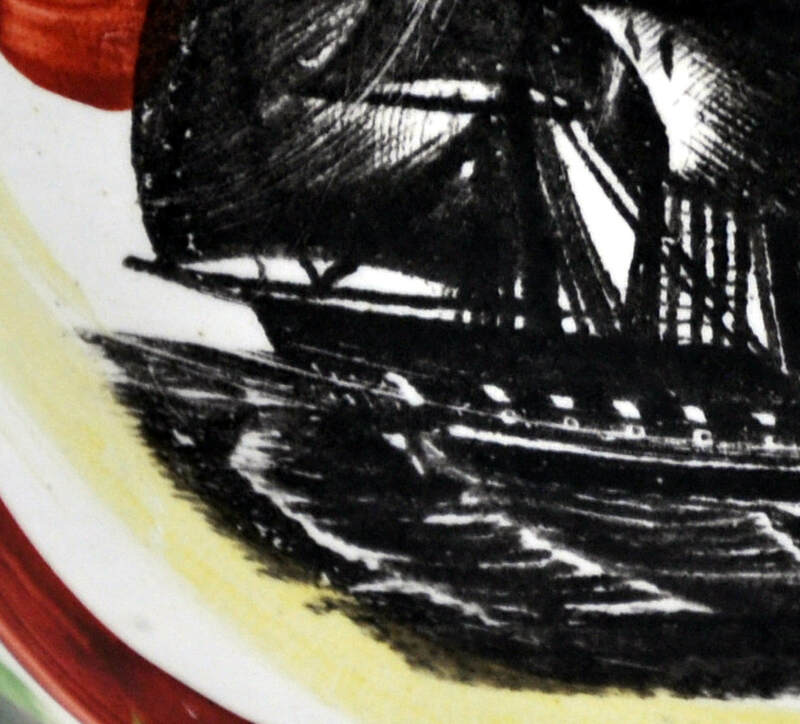 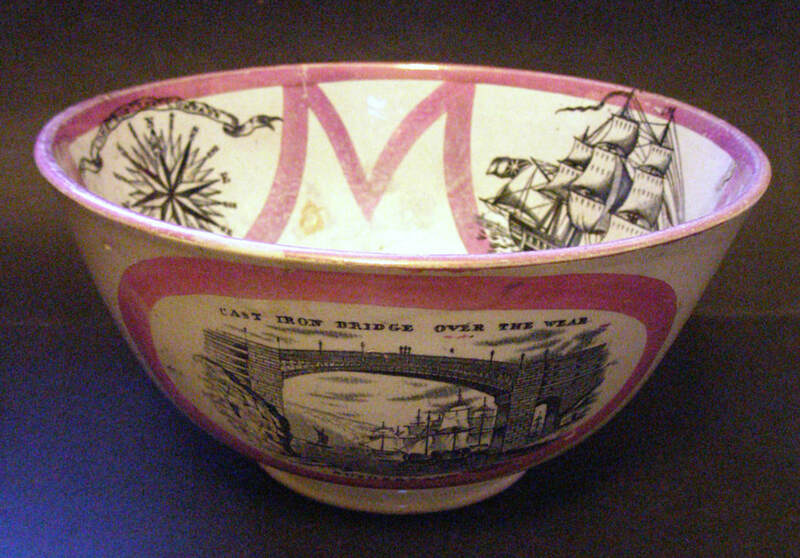 However, it is possible that other Tyneside potteries produced items with this distinctive decoration. 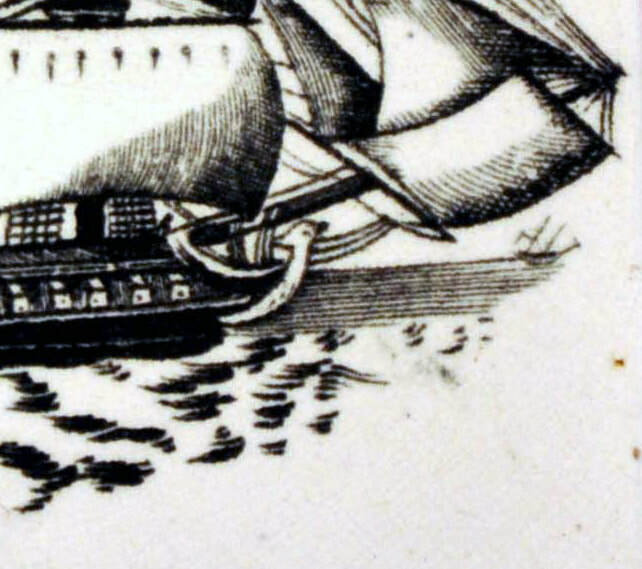 The easiest way to distinguish this transfer from the one above (group 1) and below (group 3) is to look at the rows of vertical dashes on the sails in the bottom centre details. 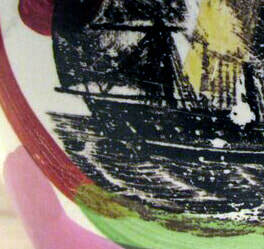 This is a smaller version of the transfer for smaller wares. 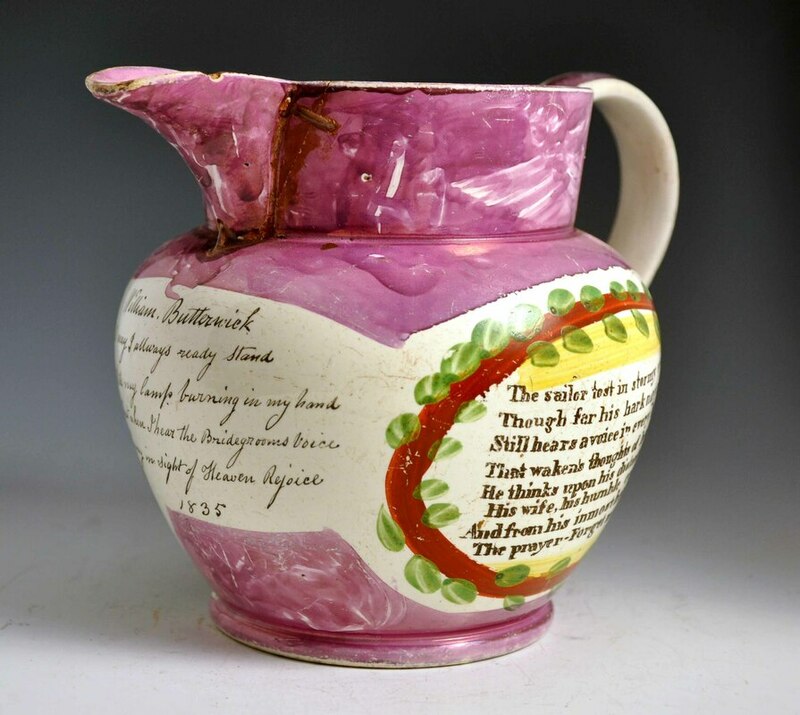 The jug has an inscription with the date 1835. 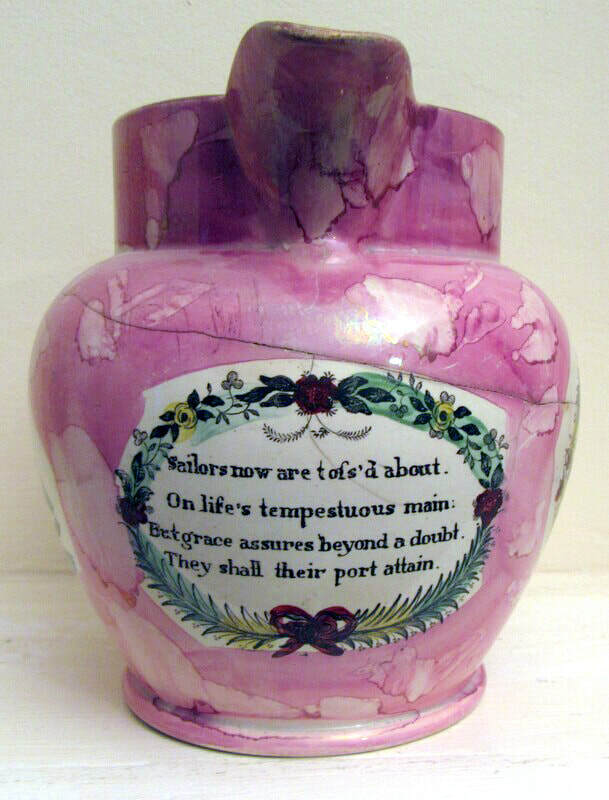 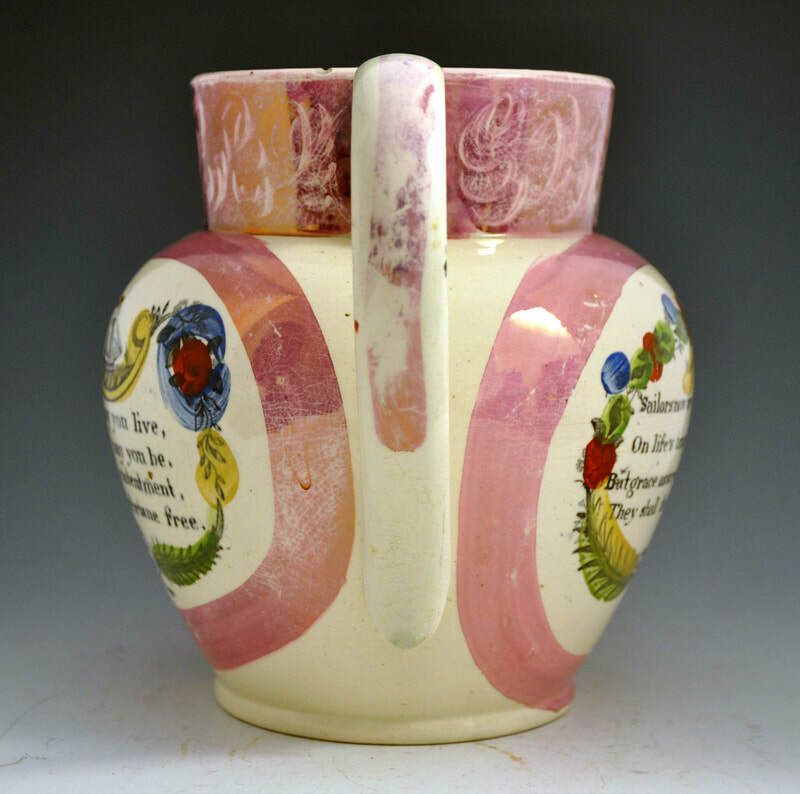 Below is another small jug with a transfer dated 1837, commemorating the death of William IV. 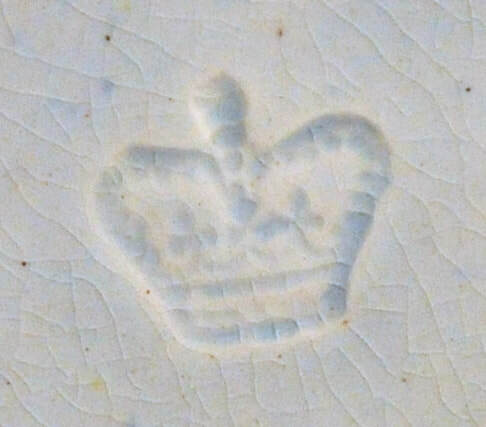 My guess is that this is a worn version of the transfer above that has been re-engraved in places to restore details. 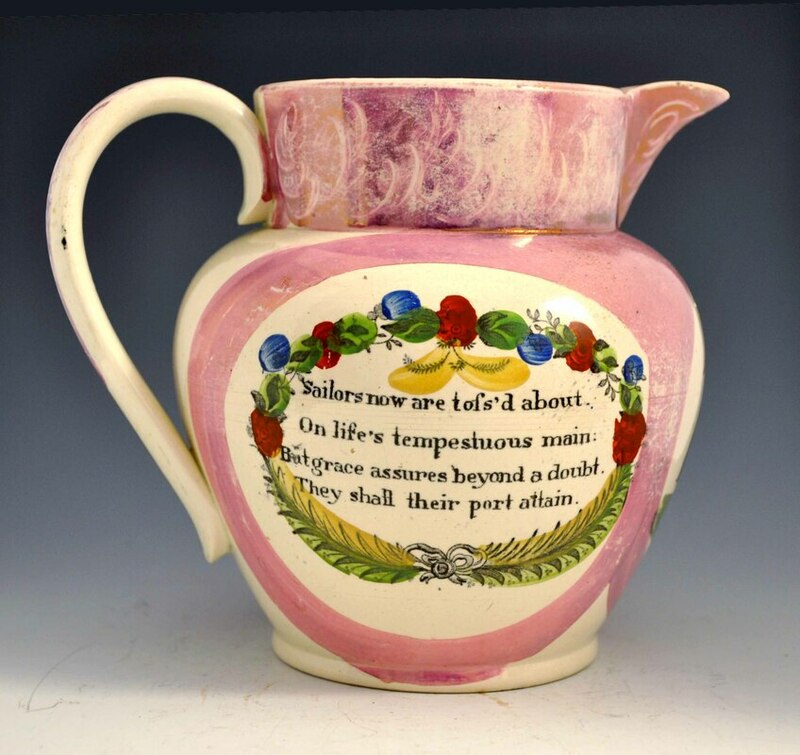 The other transfers on the jug. 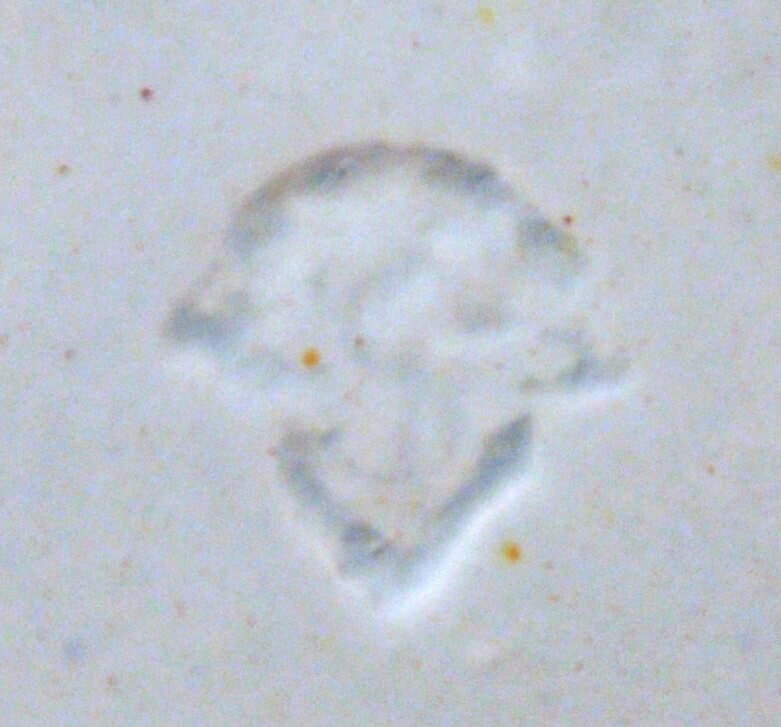 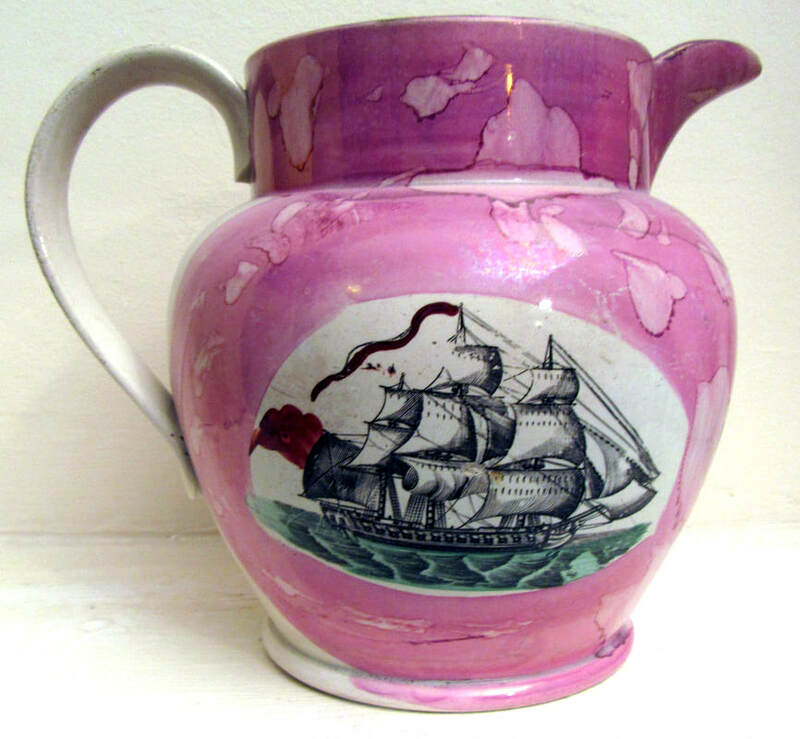 The jug below has a very similar variation of the transfer to the one above. 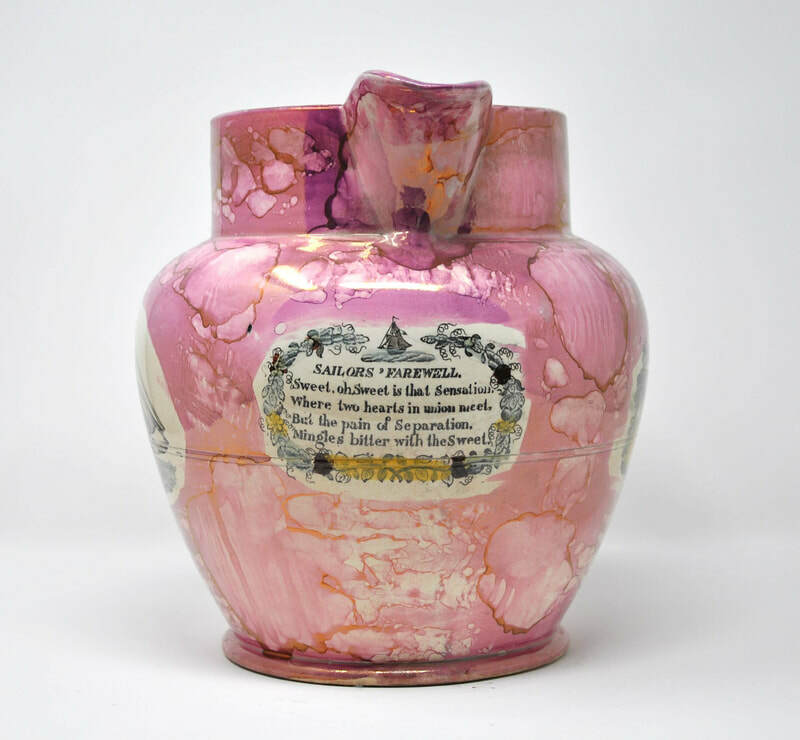 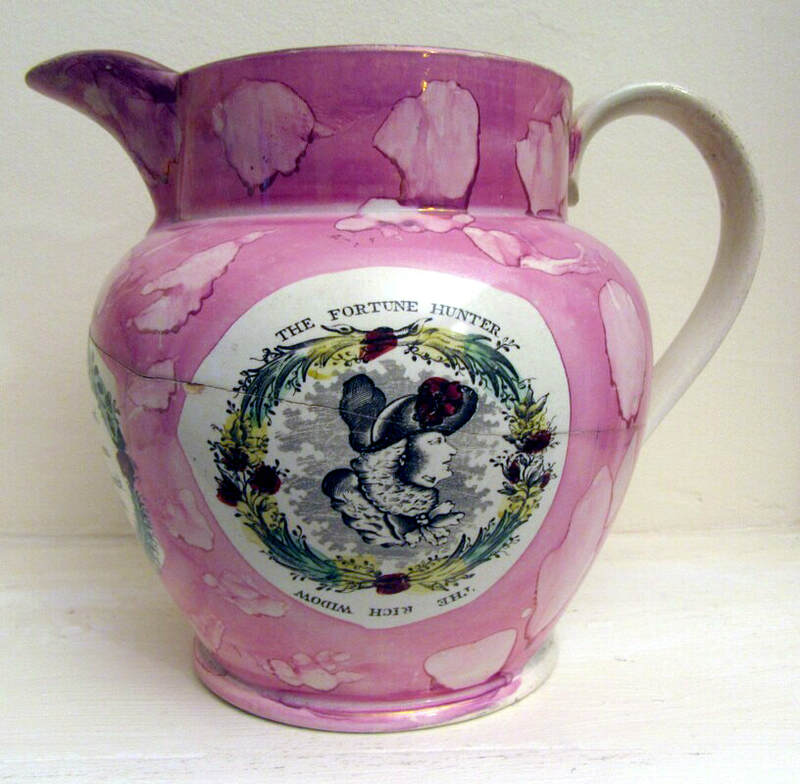 It has the inscription 'Ann Amelia Hamon, Born September 15th'. 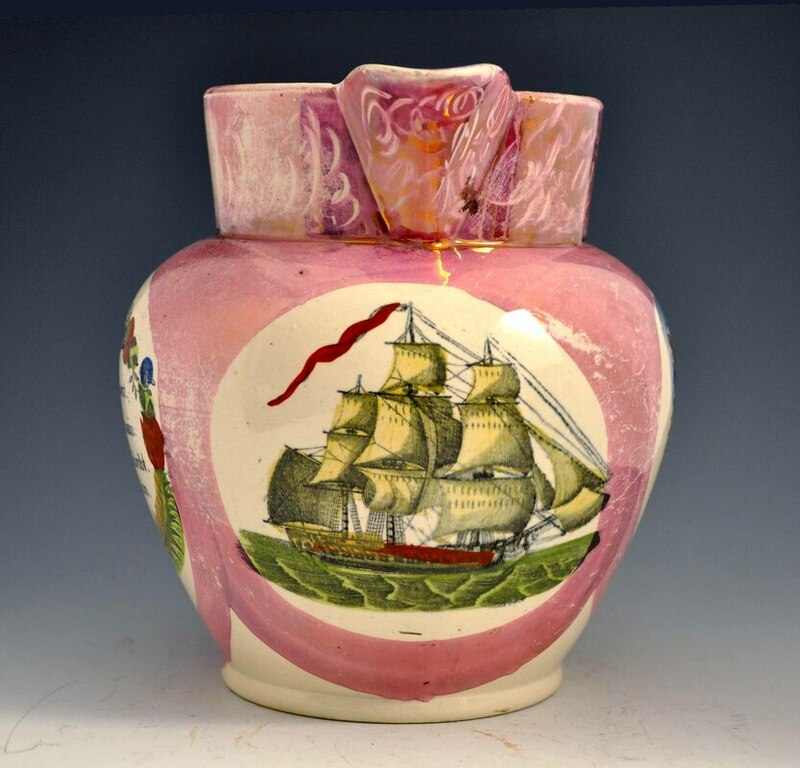 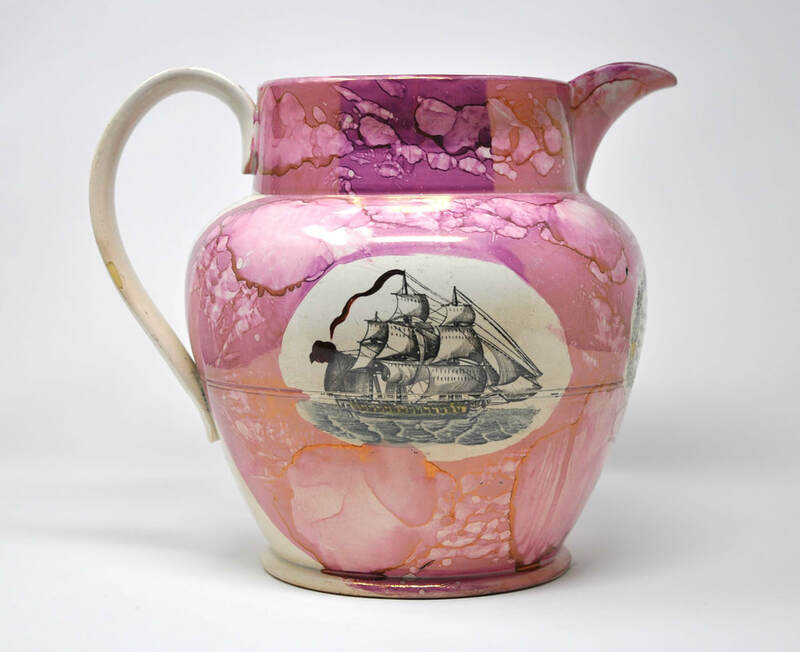 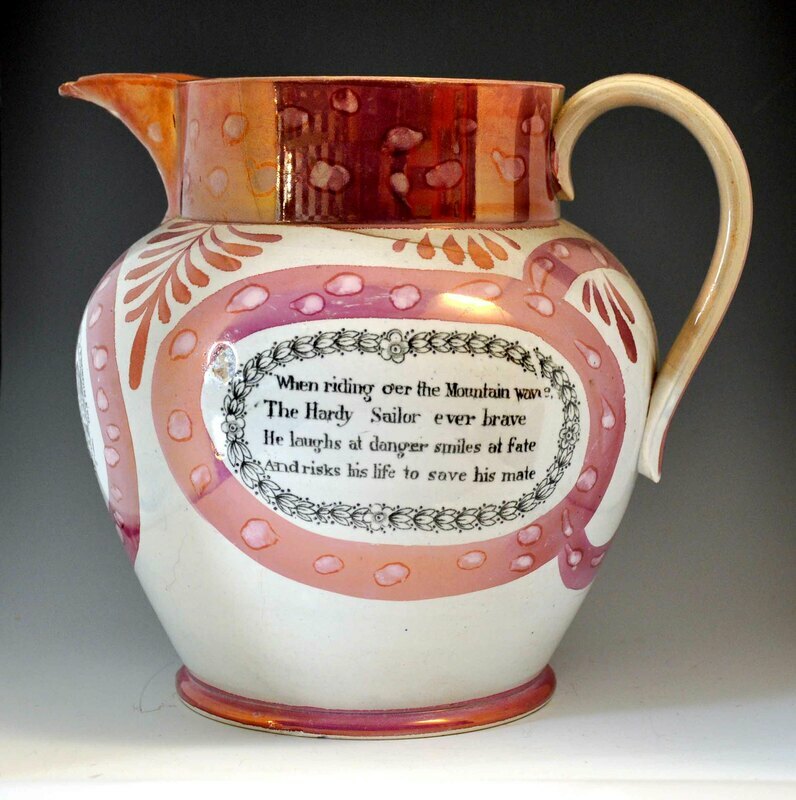 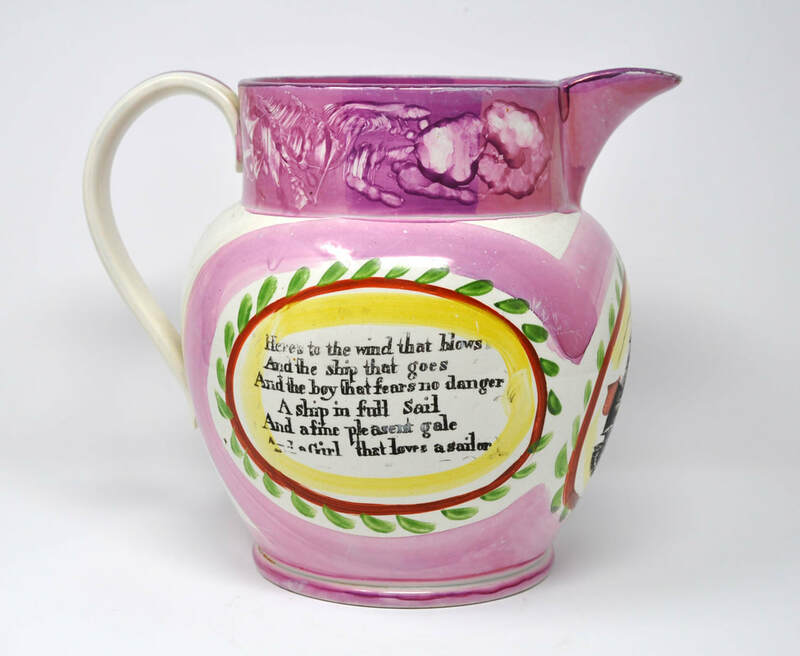 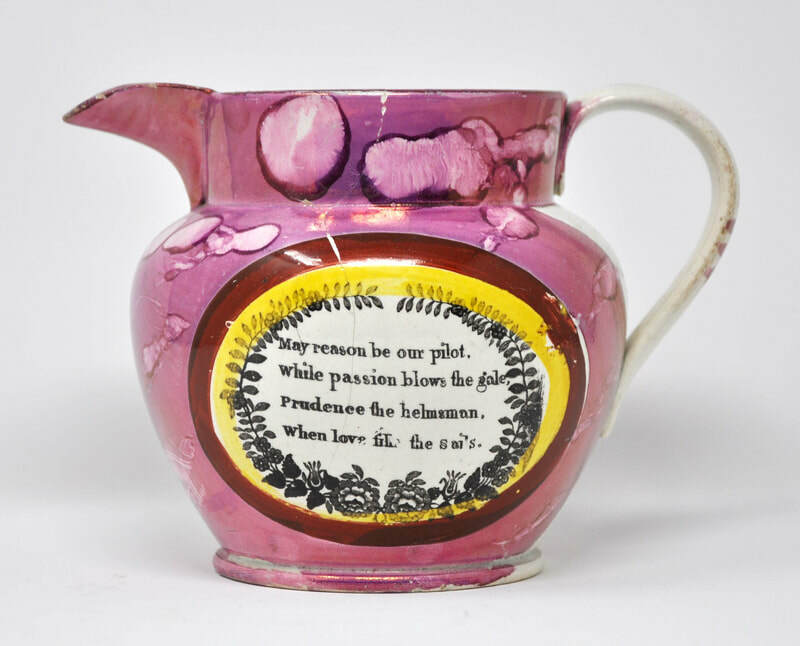 The other sides of the jug shown below, and beneath it, a smaller jug with distinctive yellow and maroon decoration, and another with the transfer 'The Fortune Hunter'. 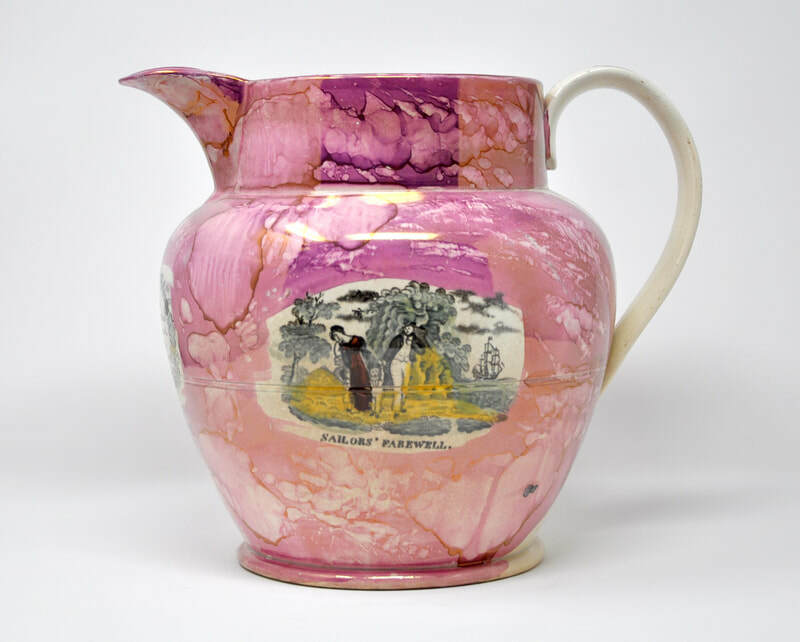 Note the lustre decoration on the handles of the first two jugs, terminating in horizontal strokes. 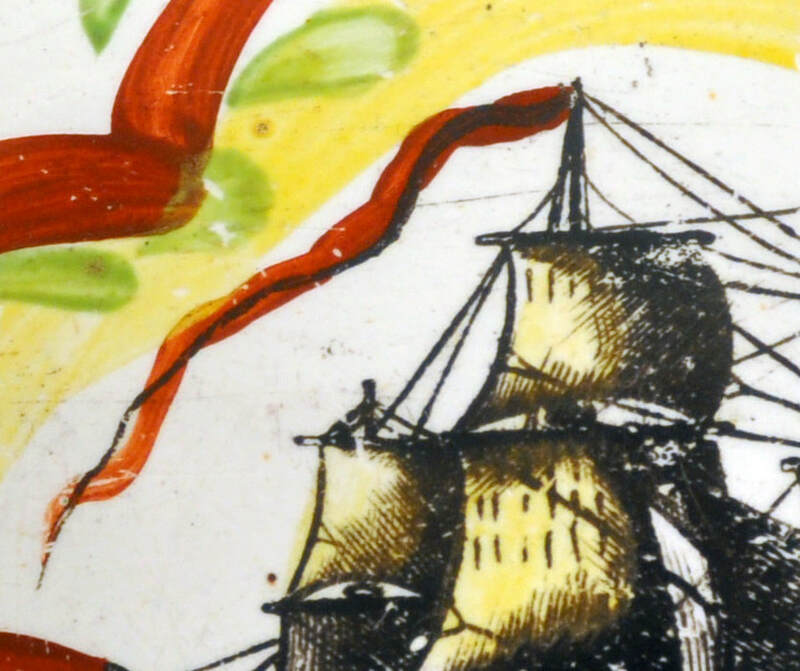 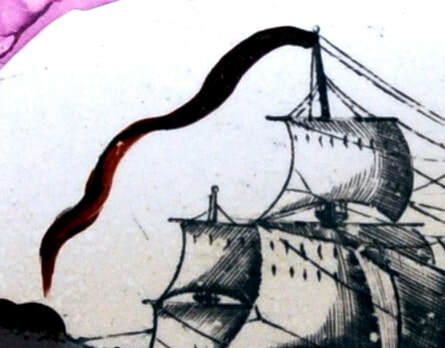 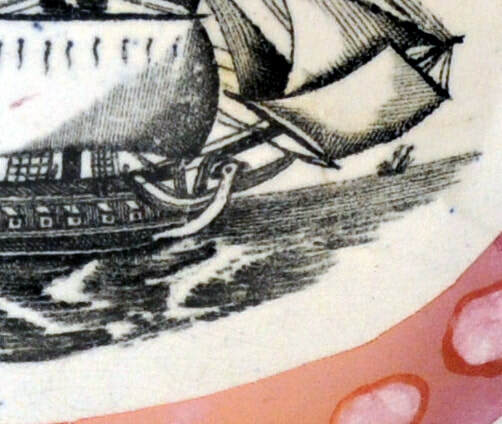 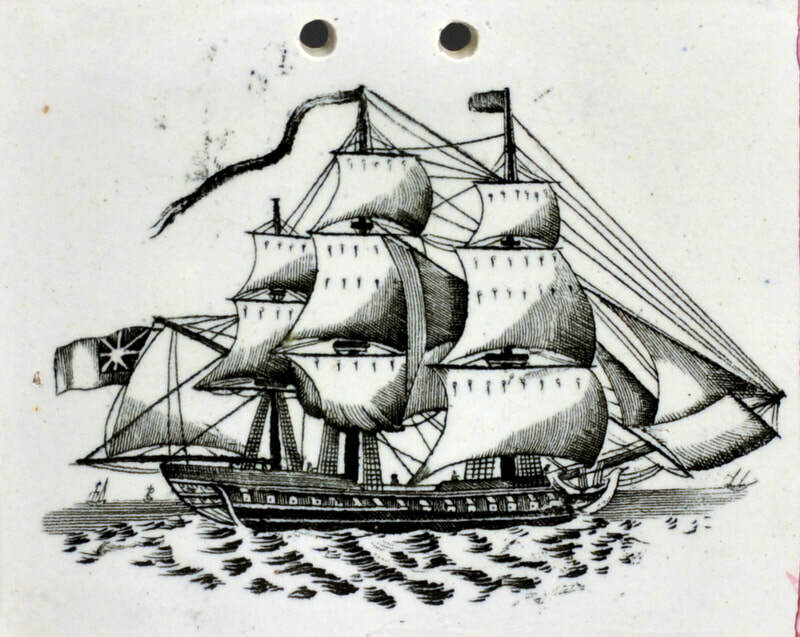 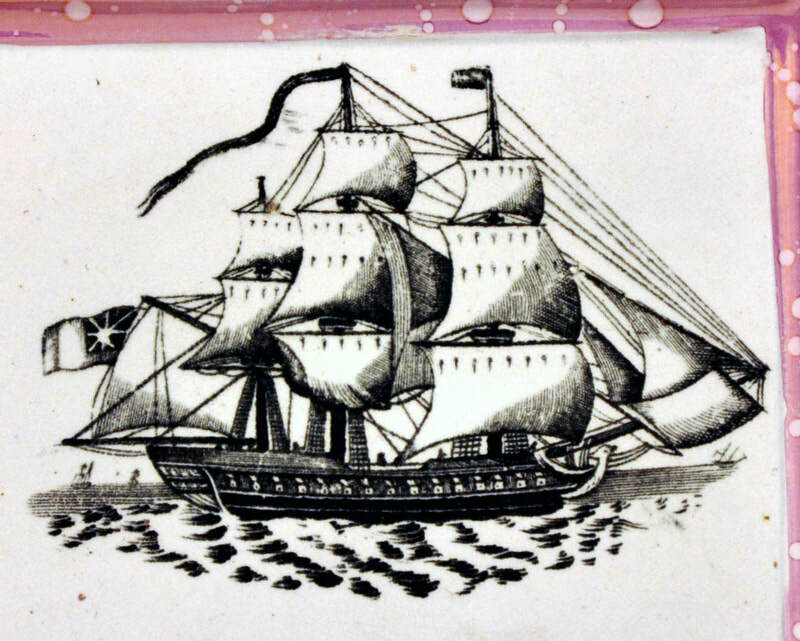 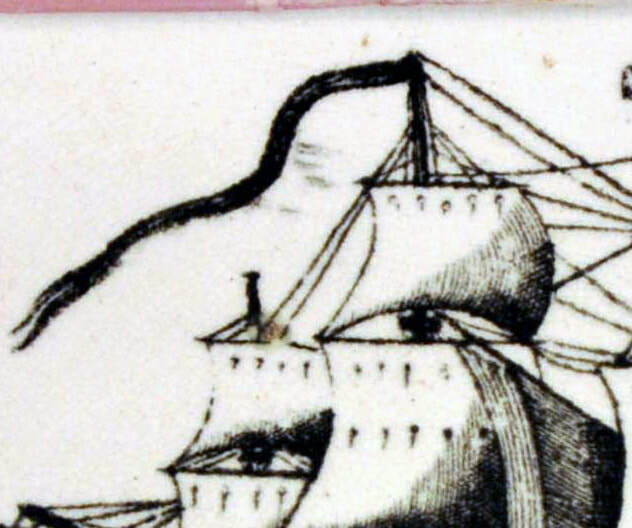 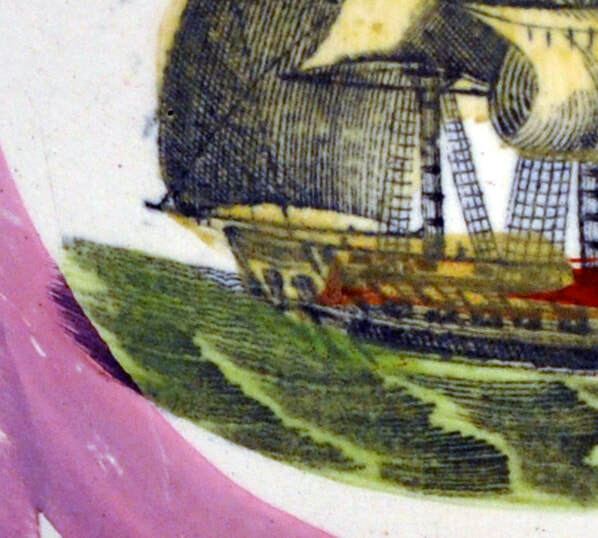 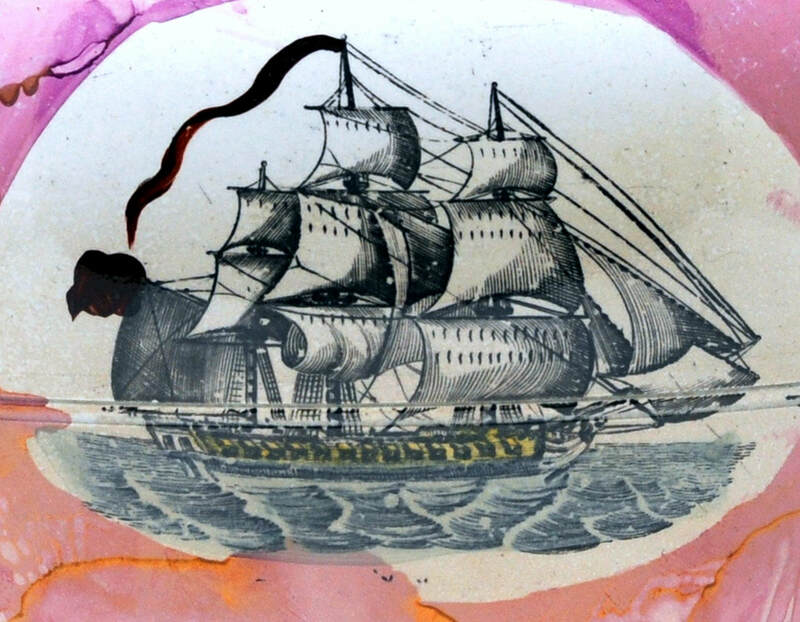 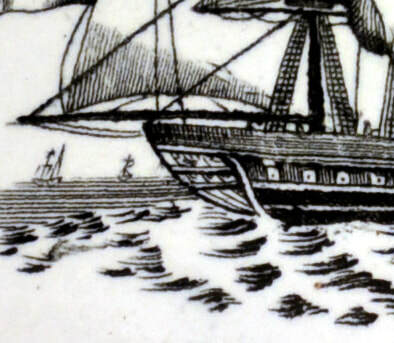 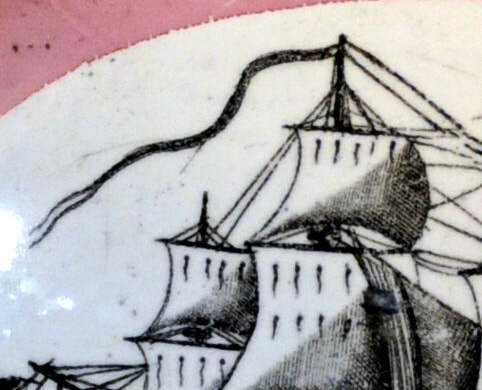 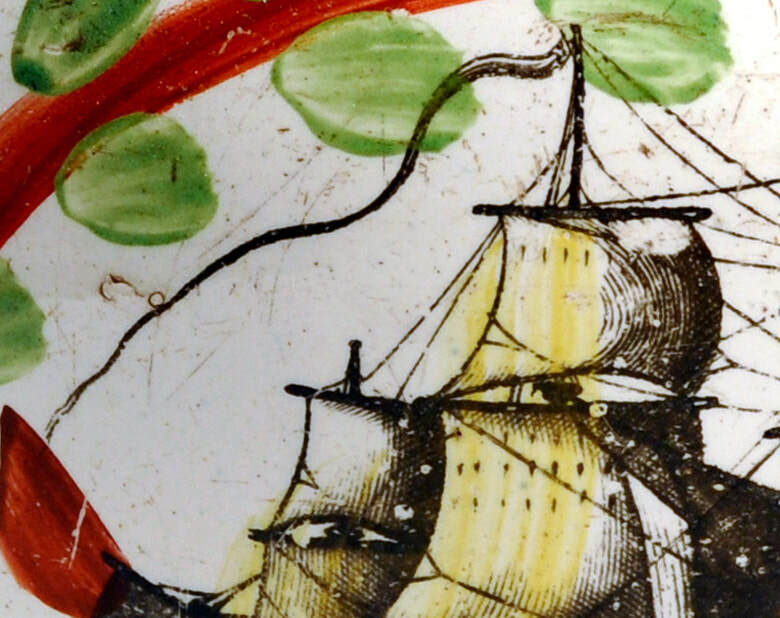 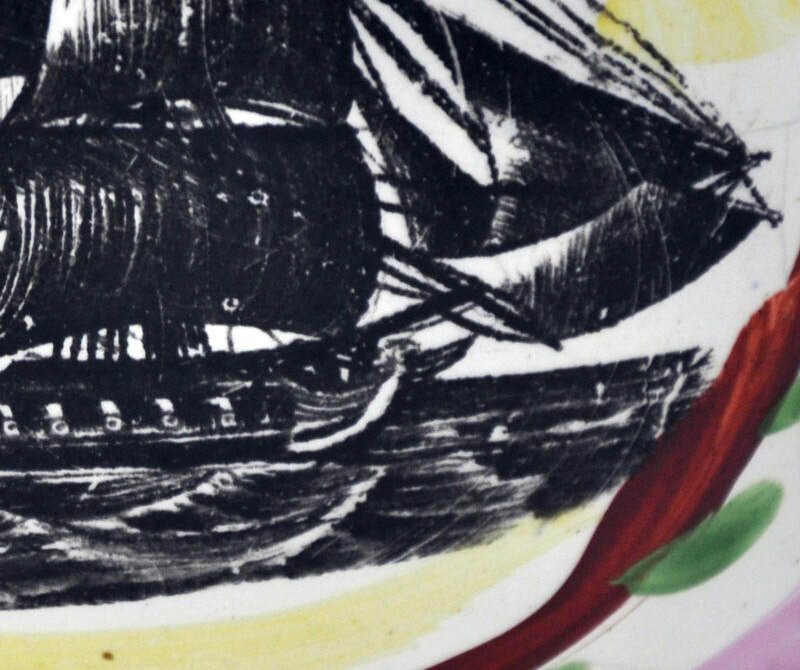 The ship on the jug below appears to come from the same copper plate. They are hard to compare because the imprint on this jug is lighter. 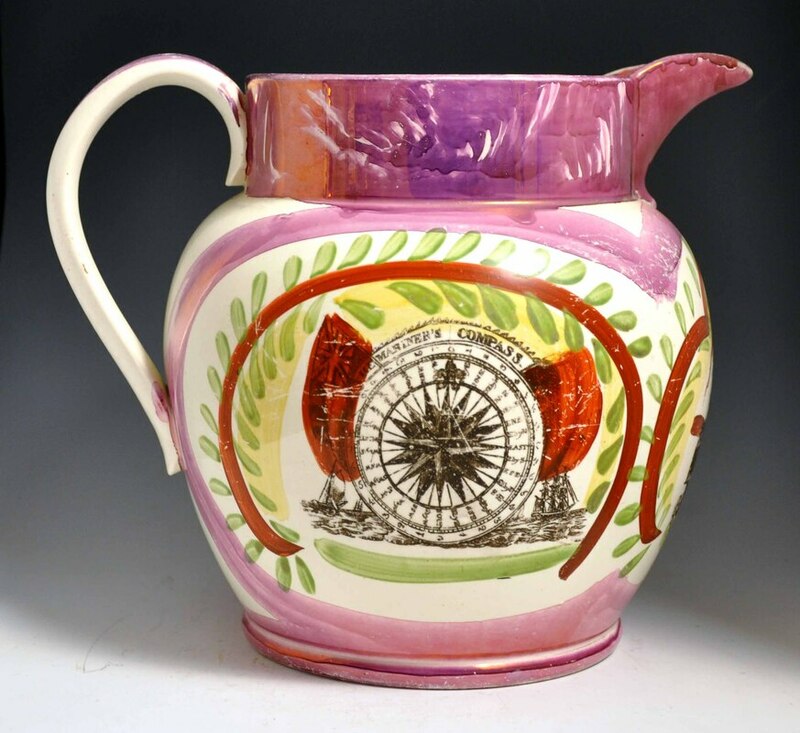 My guess is that this jug is later. 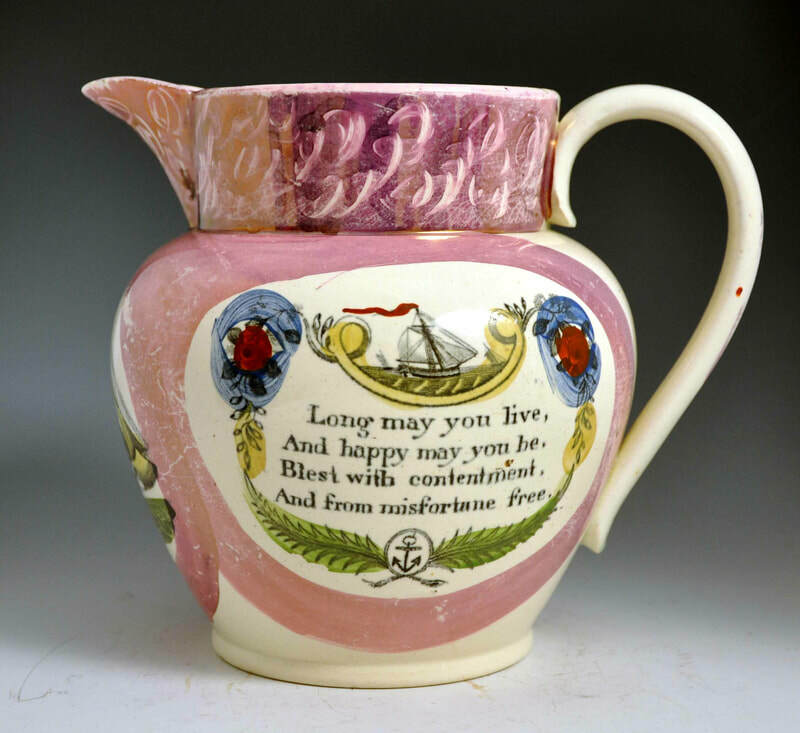 Below are the other sides of this jug. 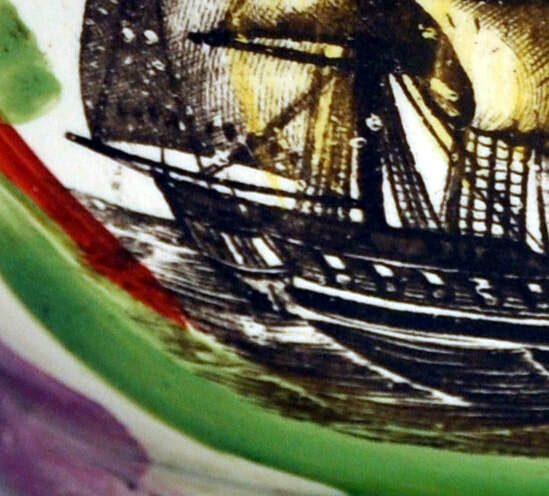 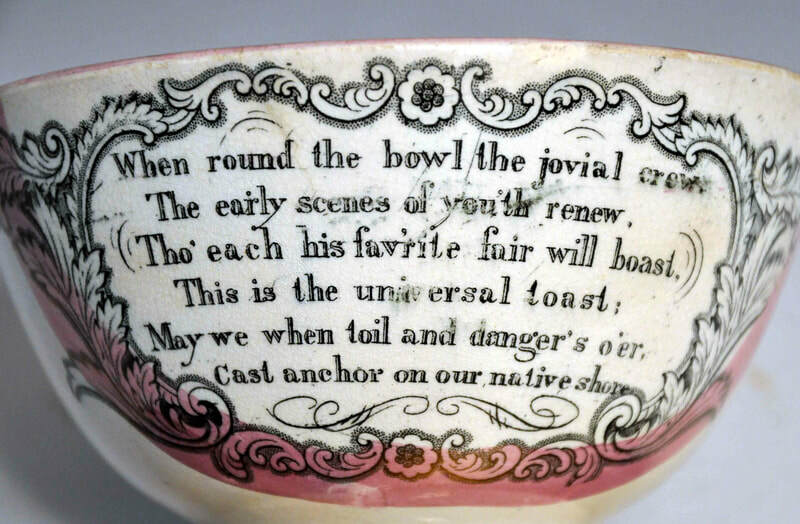 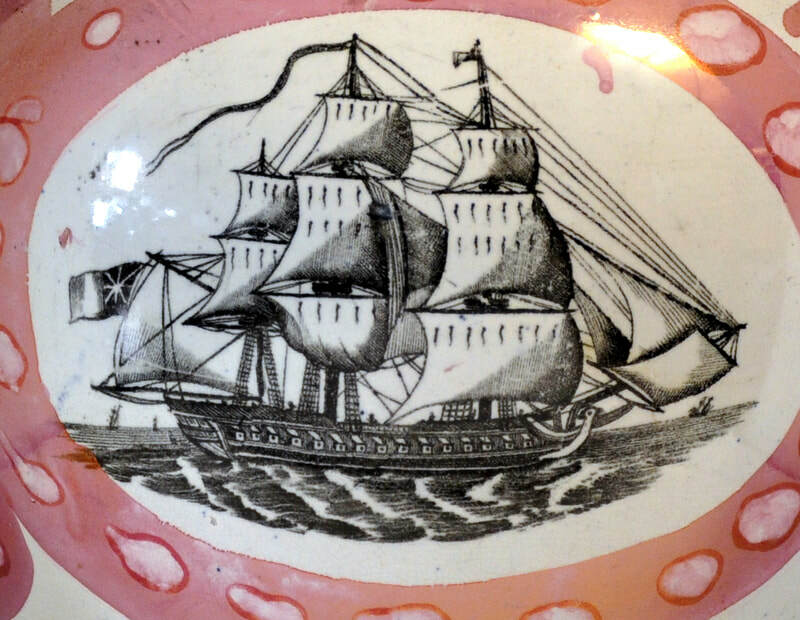 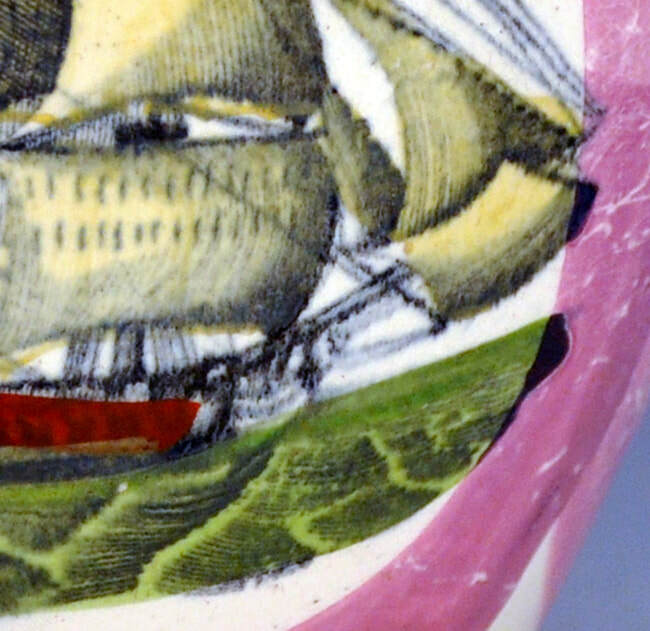 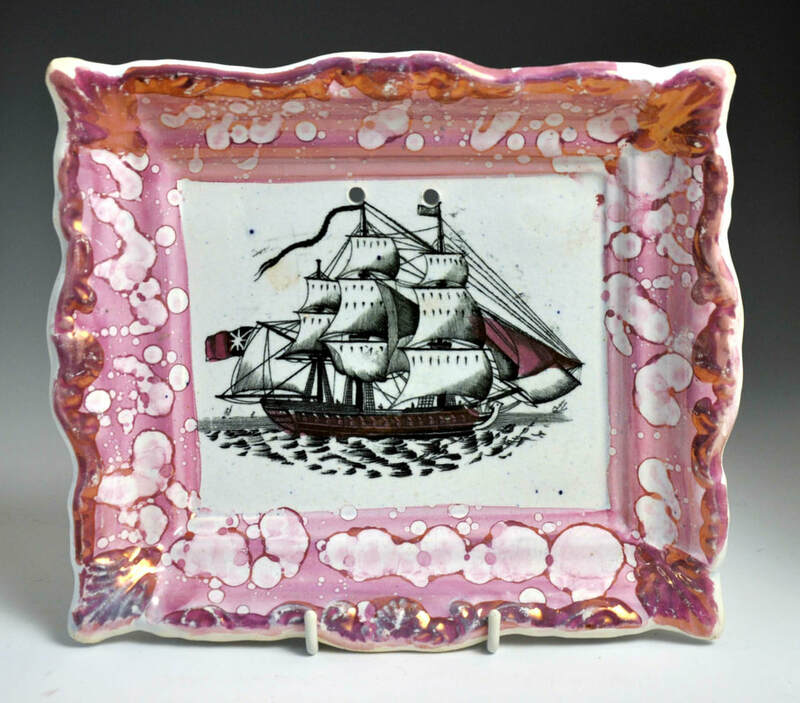 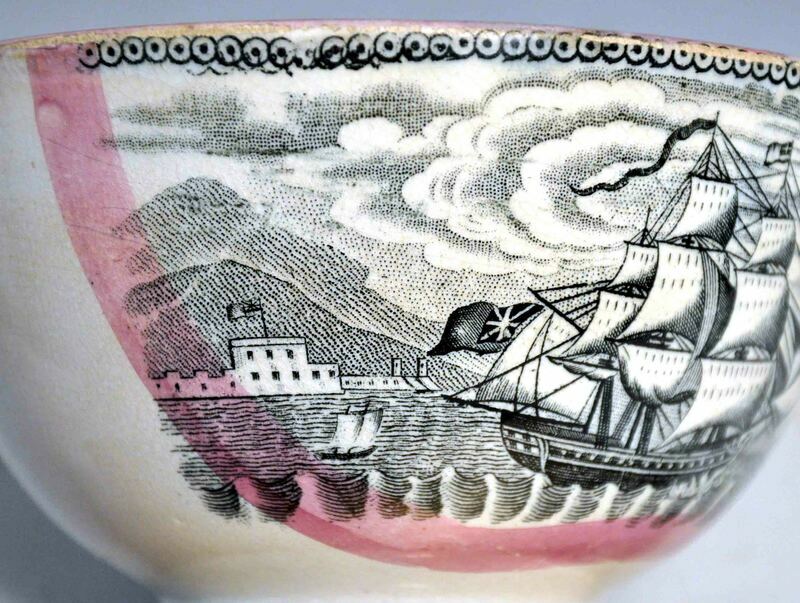 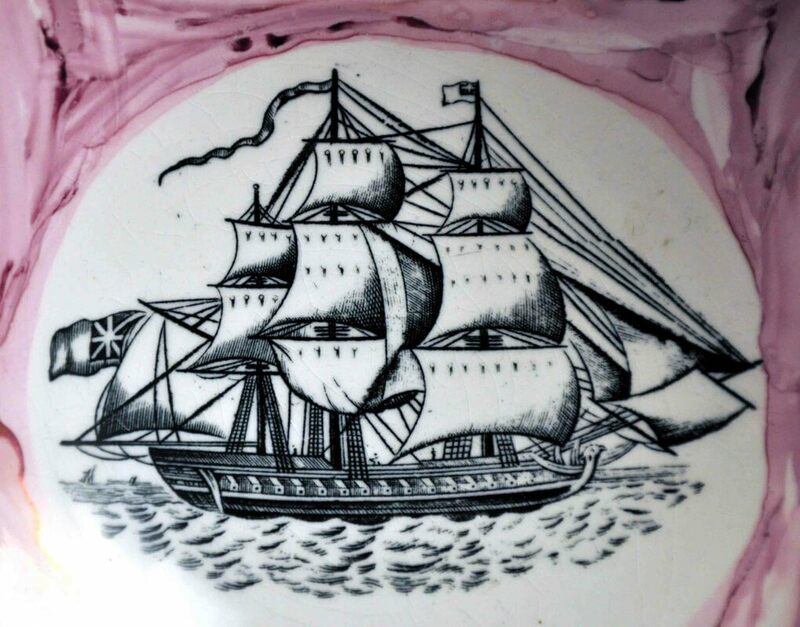 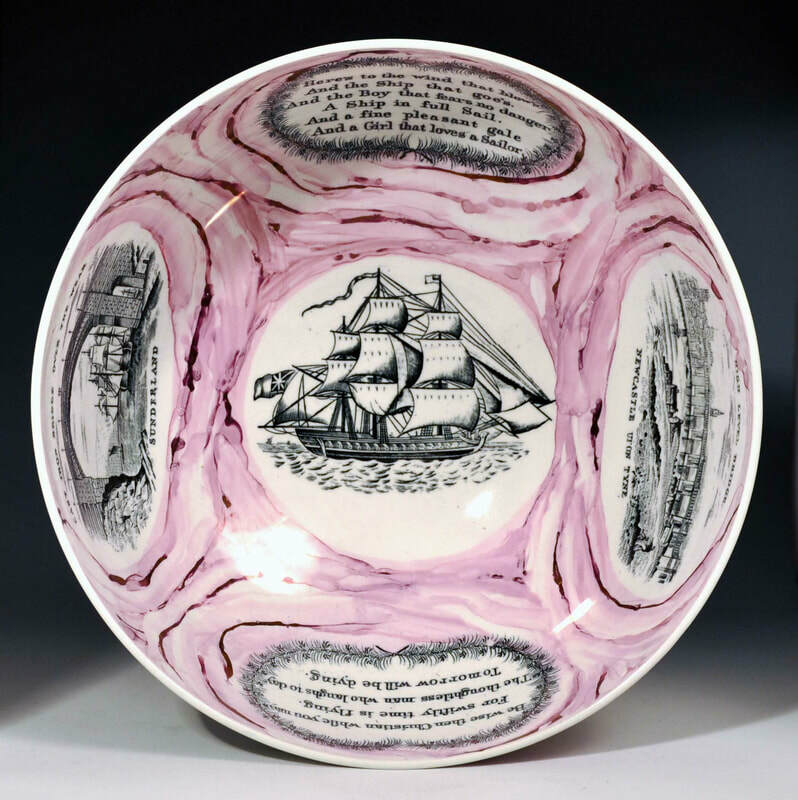 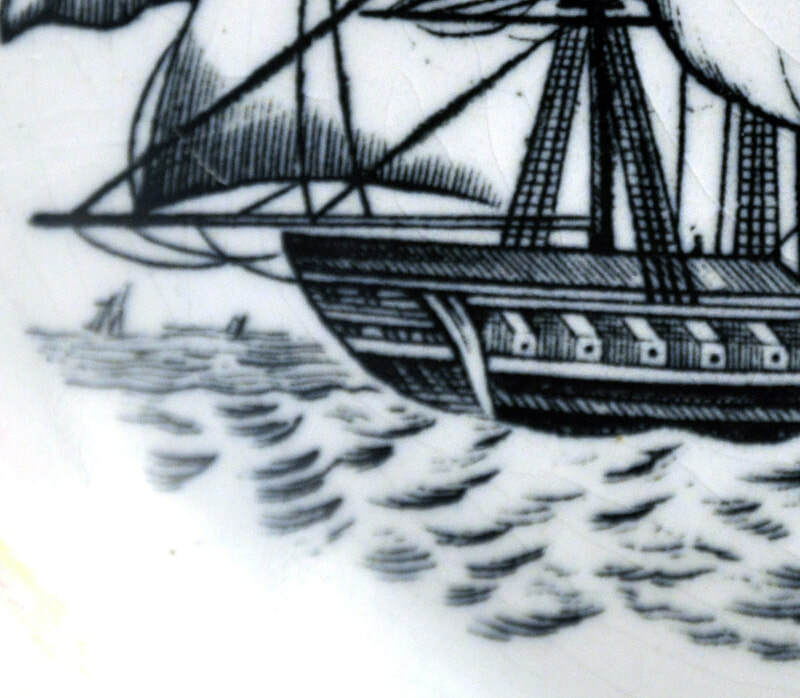 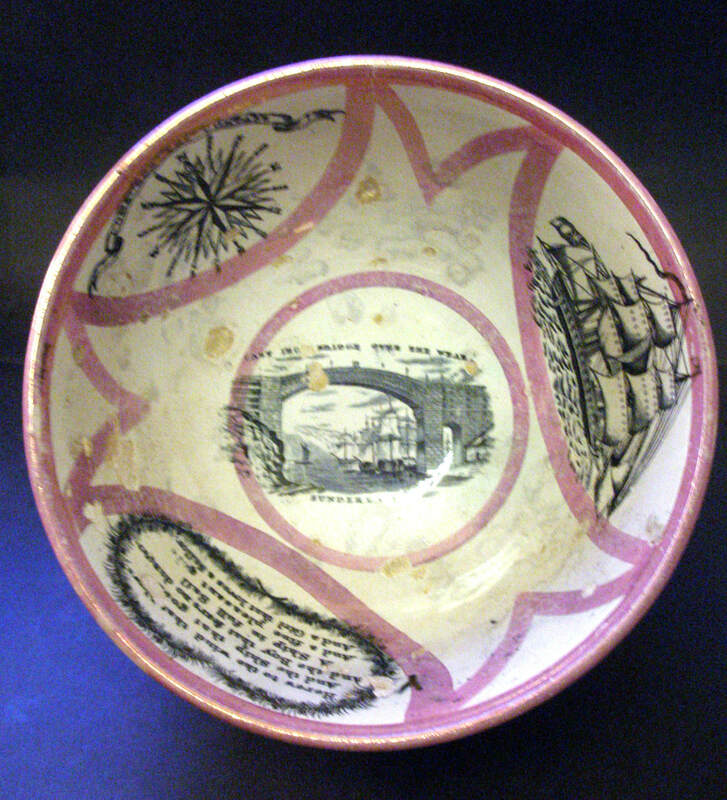 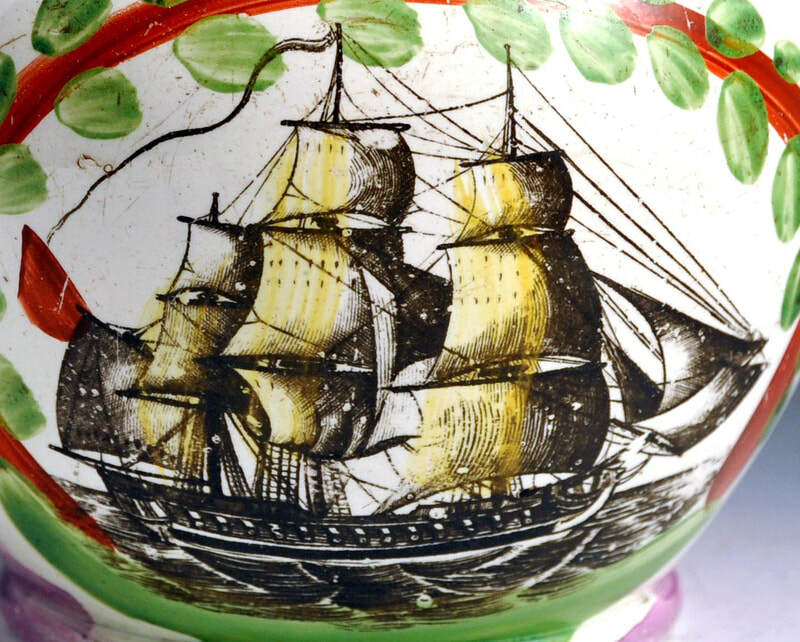 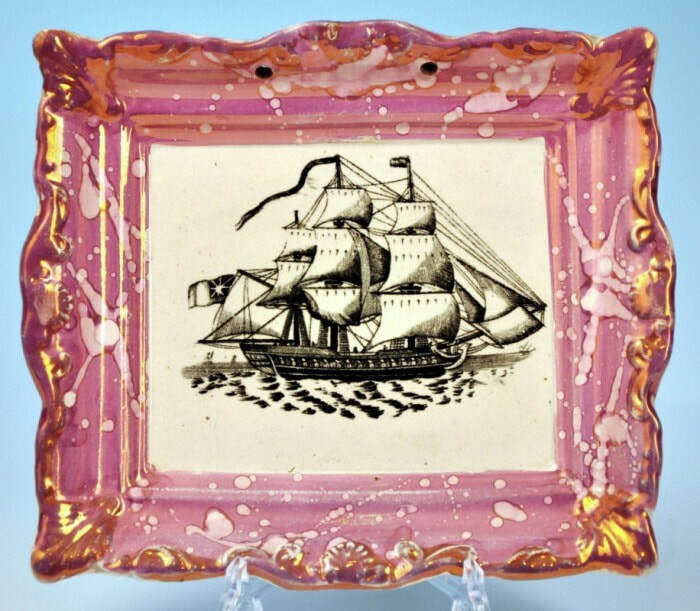 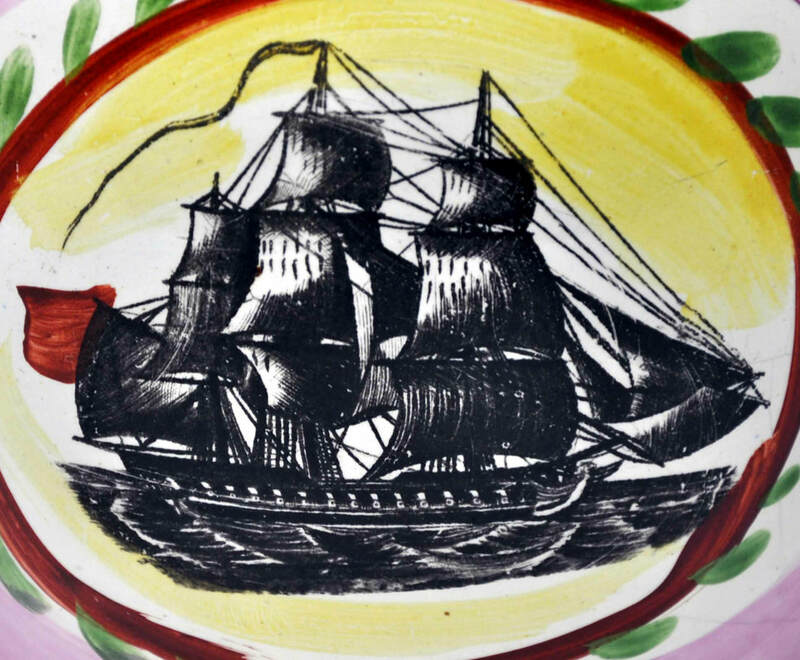 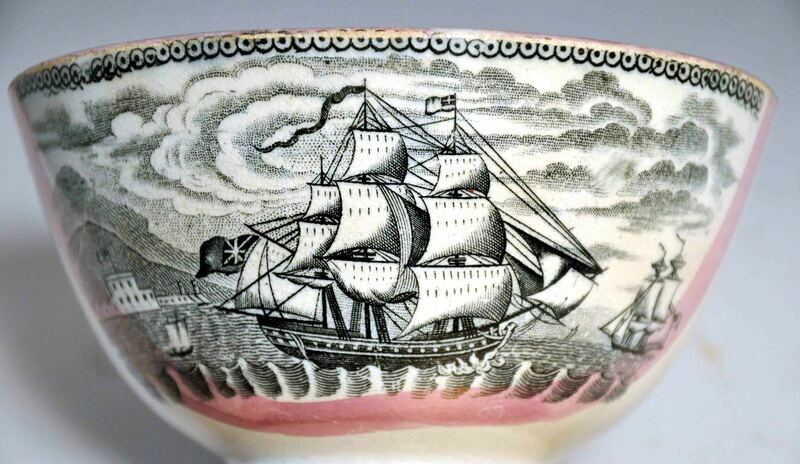 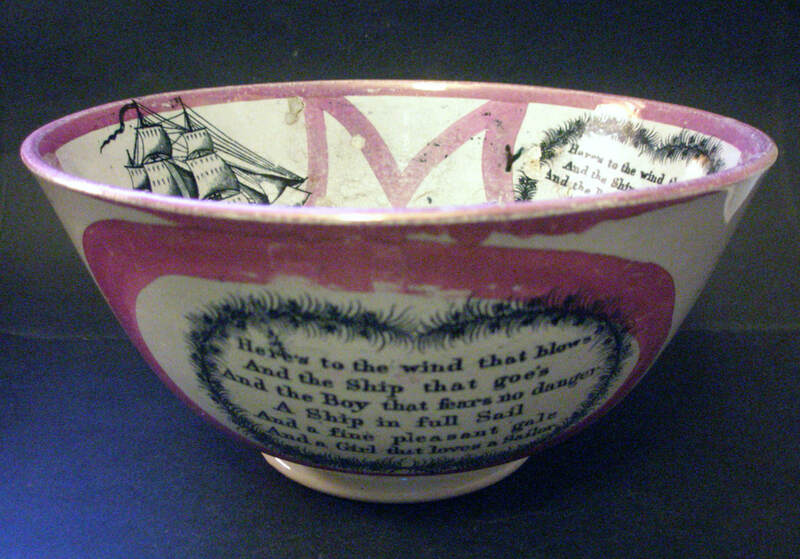 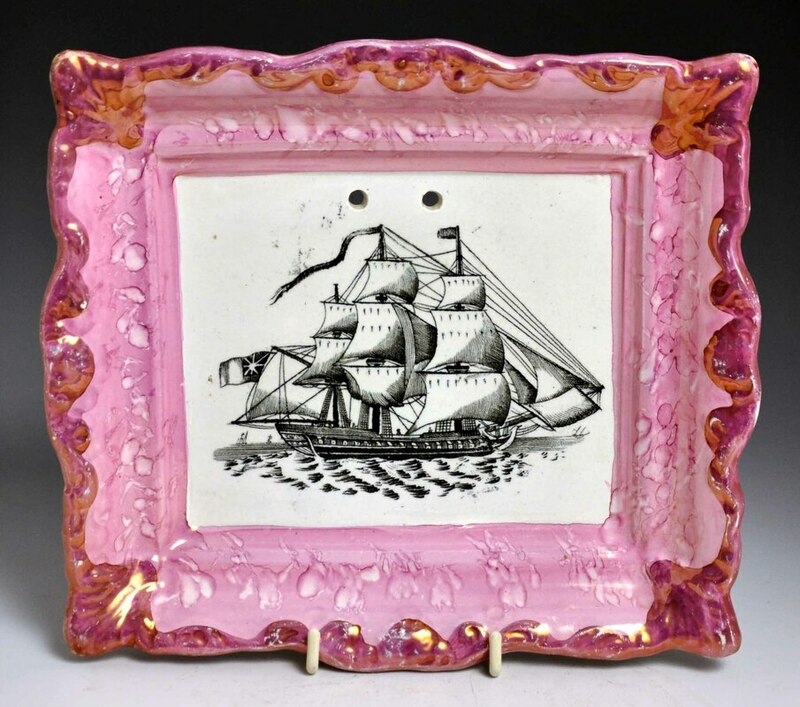 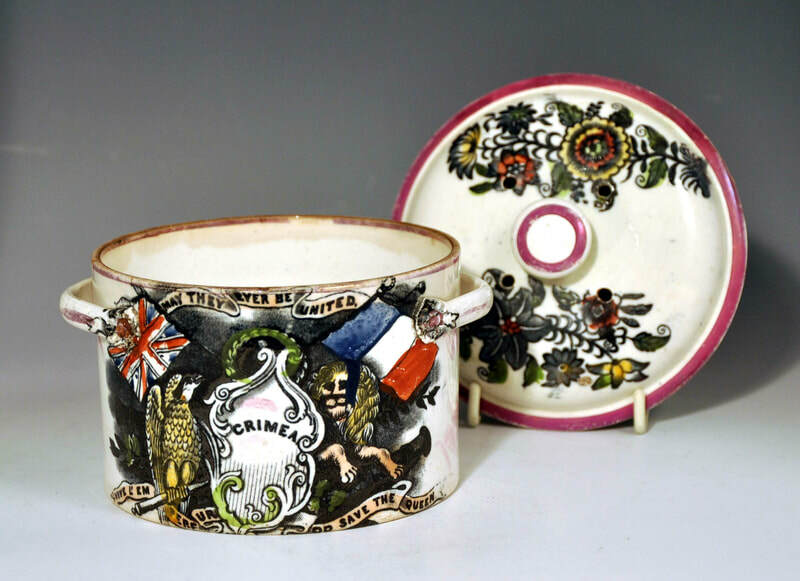 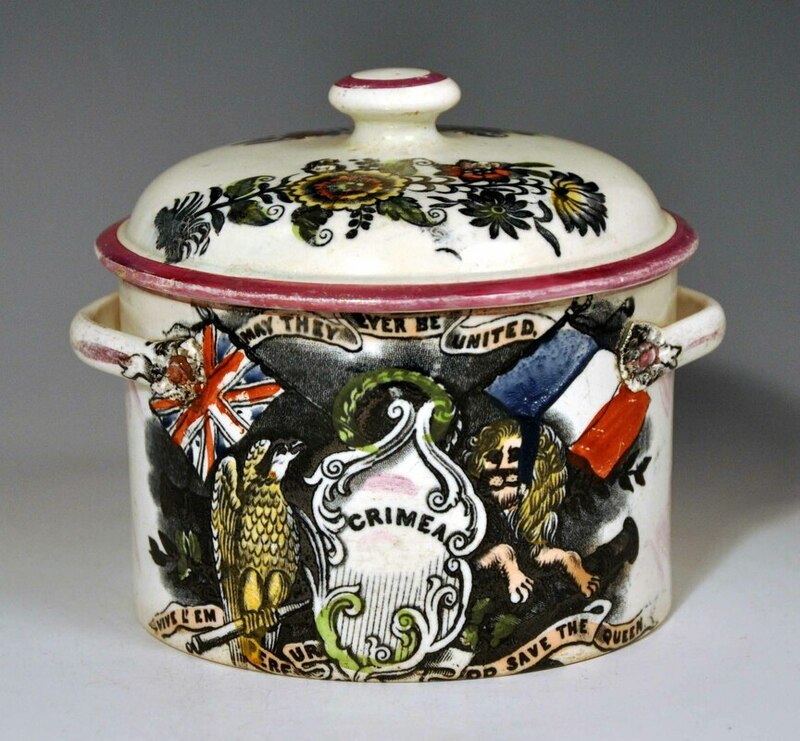 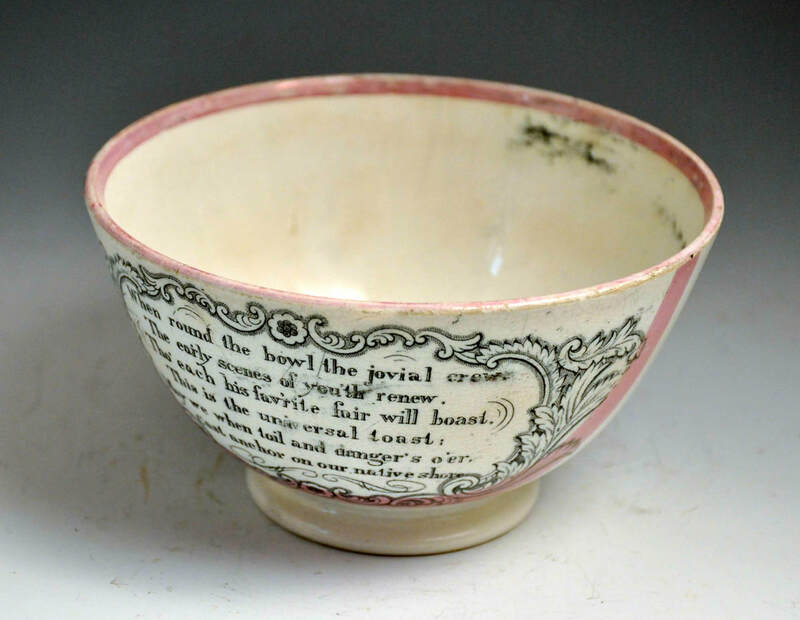 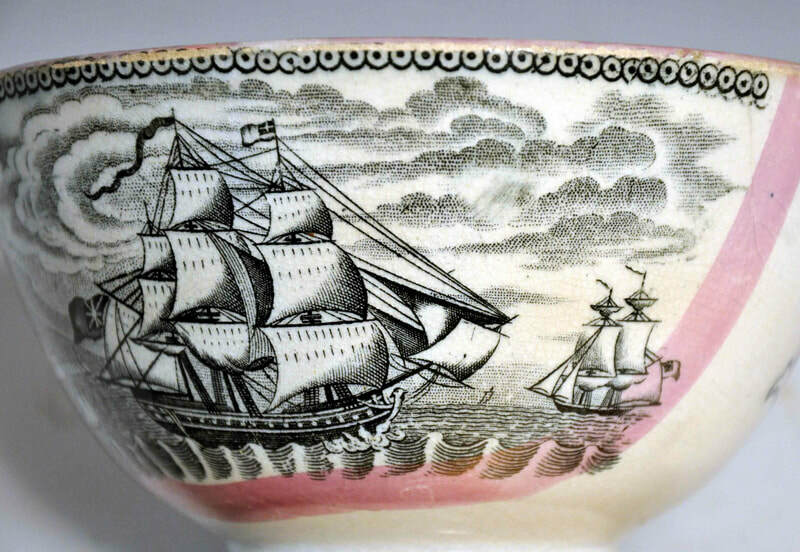 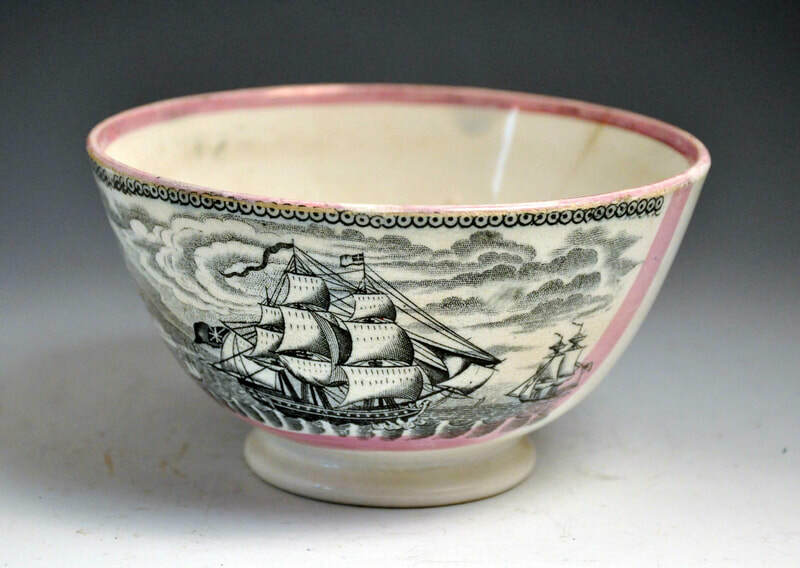 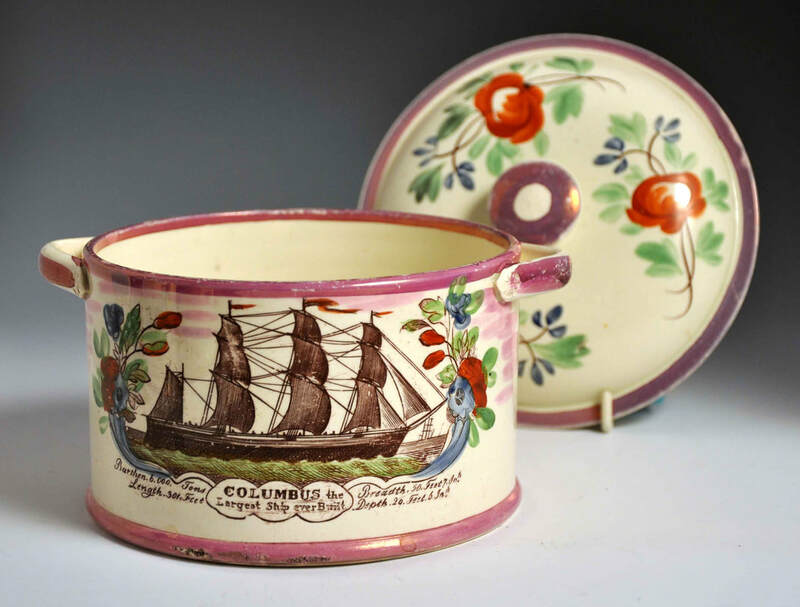 A small but elaborate version of the transfer appears on this slop bowl from c1840. 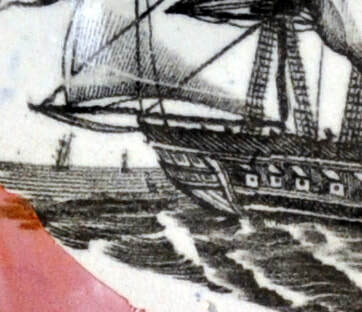 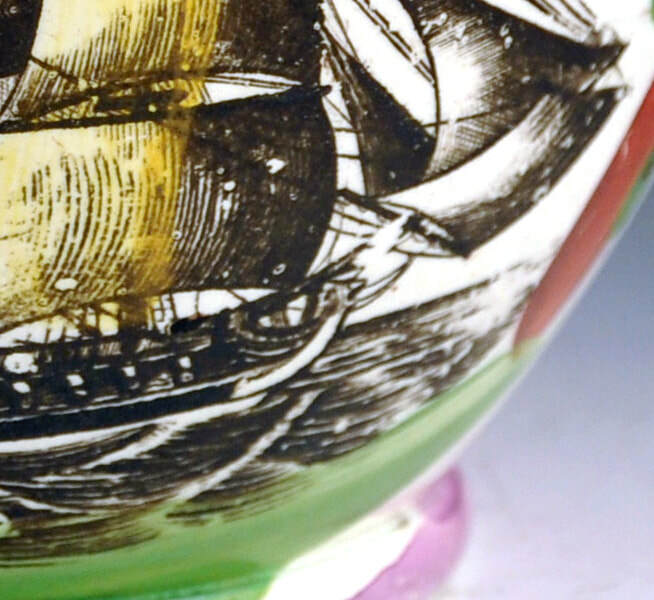 This version is similar to the 20th century reproduction at the bottom of the page, and appears on items with other transfers and decorative features associated with Maling. 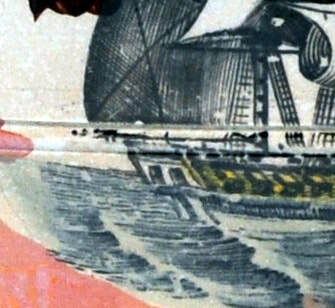 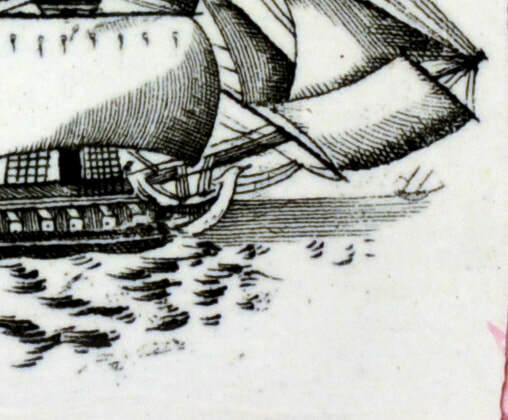 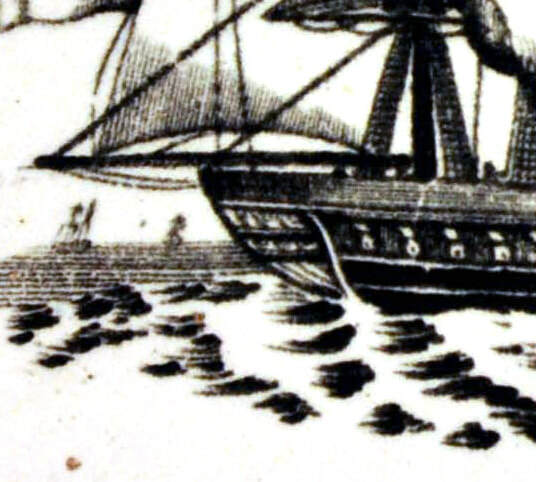 Note the rows of circles on the sails. 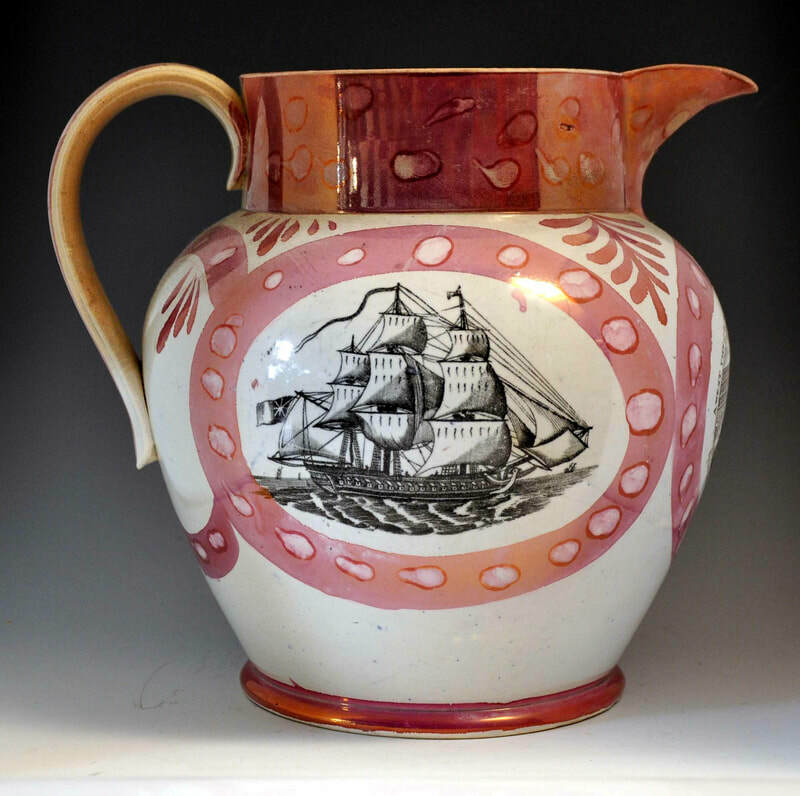 This very large jug is unmarked. 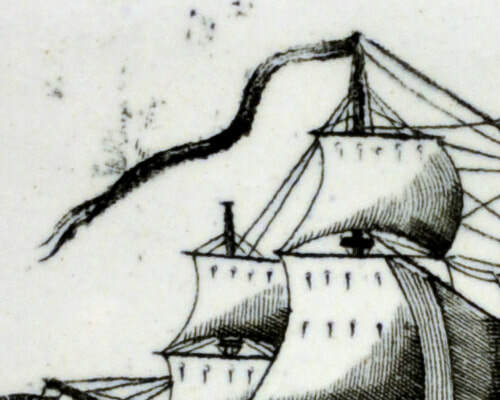 The decorative features are similar to those used by C T Maling. 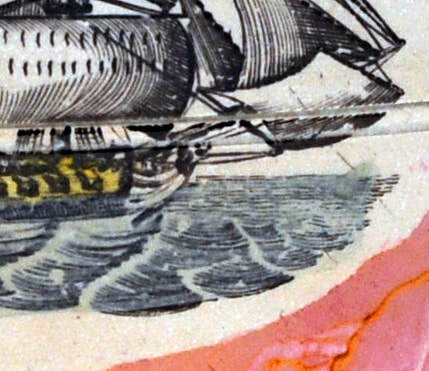 As with some of the items above, this transfer appears with others similar to those used by C T Maling.